The cliff is on the west side of the spur which runs down to Diamond Harbour from Herbert Peak. The Fantasy Factory is the larger, more obvious cliff, just below the top of the spur, overlooking Charteris Bay. It is sheltered from easterly winds. 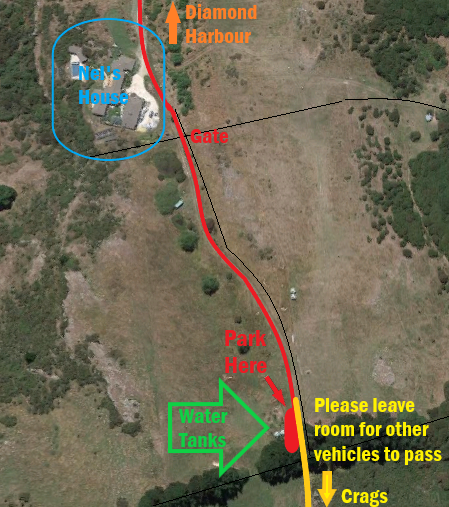 Access is from Charteris Bay, along Bayview Road (turn R off the main road before the yacht club). Drive along Bayview Road for approx 1.5 kilometres and turn right up Doris Faigan Lane. At the top of the Lane go over the cattlestop and up past the house to park under the trees near the water tanks. If a car isn't available, catch the ferry to Diamond Harbour. Go through the gate and walk up the spur for several hundred metres until opposite the top of the cliff, sidling above a patch of gorse to pick up a track marked with red and faded pink tape which descends to the base of the cliff. As can be seen from the names of these crags and some of their climbs, there was a post-hippy boom going on in Christchurch at this time. The cliff was discovered in 1975 by Tim Wethey and Mike Franklin. Wethey produced the excellent **Shortcut To Mushrooms (18), and *Mindbender (20), one of the hardest Peninsula climbs at the time. Mike Franklin contributed **Bitterfingers (16). In 1979-80, John Howard contributed the hardest route on the cliff at the time, *Birdbrain (22). In the late 90s there was a resurgence of new sport & trad routes by Richard Kimberley, Tony Burnell & Alan Hill. Xena - Warrior Princess 30m descent. There are other rap stations just below the edge of the crag which may be possible to use with redirecting the top of the climbs. Permission must be granted from two sources! 1. The owner of the land the crag is on - Zac Kyle. Please text 027 604 1485, and only proceed once you have a reply. 2. The owner of the land you cross between Doris Faigan Lanen, and the crag - Peter Nel. Text 021 223 4478. Please keep the traffic light!!! One car with 4 people is a lot less intrusive than 4 cars with 4 people. (Pool your cars at Diamond Harbour). Park Considerately! Please leave enough room for a tractor to go past into the neighbouring paddock, and do not attempt to drive beyond the water tanks. No access during September, as it is lambing season. Walk through from the public road, don't drive. The usual rules should be observed - leave gates as you found them, no fires or sources of ignition and leave your dogs at home! The twin cracks in a corner. Up an easy corner to the bulge (crux) and loose blocks, then up the cracks. The first gully, from the left that goes the full height of the crag. Up grooves and over ledges for about 20m. Then step left and climb the crack over a large block (crux), and finish up the corner. Not always the best kind. This route climbs the arête to the right of Faigan. The start is contrived with first pro at the arête and the moves somewhat to the left. Then move up the right side of the Faigan groove to the ledge and on through the overhang to a detached pillar. Straight over this to the ledge and then up a leaning pillar on the right to the exit corner. Anchor to a boulder. Pull over the overhang and climb the slabby, lichenous wall with reasonable protection to a ledge at 8 metres. Then up the groove above (gear on the left) to an easy low angle slab. Climb the exit corner, stepping past the bush to the right, and anchor at boulders. Start on the slab just left of the big corner, moving right for the first gear fairly high at a flake. Step left and climb up to a small cave, then into the groove above. Step right and up (crux) at the overhangs. Over broken ground and into the right-ward slanting crack, finishing on the prow. Climb Scabiosa to the roof and pass this on the right with a short committing wall to gain the exit crack. The prominent corner-gully. The first few metres is the hardest, with typical Fantasy side-pulls and down-pressure moves. Climb the gully, traversing right below the big roof. Continue up cracks beside the arête to exit in the right-angle corner. The crack on the right wall of the gully. Continue up directly, and exit slightly right in the same corner. Start in the Scabiosa gully, go immediately rightwards to gain the face above the balcony,climb the wall when the angle eases past the 4th bolt, veer left onto the lefthand crack, then up the corner using the rap station just rightwards of the top of the corner. Eats smaller trad gear. Lots of protections after 3rd bolt. Start up the face to the right of the Scabricosa Arete, follow the line of 5 bolts, up to a steepening brown face, crank off the fins to get through the overlap and cruise to the top via a few corners and small face to a DBB. On the wall to the left of the big gully with the overhanging headwall. Up an indistinct groove to a small roof at about eight metres marked with bright yellow lichen. Continue up the crack and directly over ledges to exit in a shallow groove left of the prow, or up the steep crack. Double bolt and chain anchor. Start as for Twinkle Toes behind the cabbage tree and step left to the vague groove below the roof. Place a vital wire securely below the roof, then step down slightly and traverse left on good holds to meet the left-facing corner and crack. Thread a sling for pro and climb through the small overhang, and then follow an easy ramp up and left a bit with spaced protection. Carry on and exit up the crack just left of the prominent prow. Double bolt and chain anchor. Start with the same traverse left from the cabbage tree and climb the groove to the roof. Pull through on good holds, stepping right to a hidden crack for gear. Follow the weakness to a tiny bush and balance up the wall (crux) to a good crack with easy climbing to the ledge. A technical sequence follows up an improbable looking wall with vertical edges to a small ledge. Take the same exit up the crack left of the summit prow. Start at the small cabbage tree and climb the roof above the tree, with good small gear at the lip followed by a large spike and sling runner. Balance up a vague groove (small wire) to good holds and then a crack. Step left around the pillar and up a few metres to the same technical wall section as for the previous route, leading to a steep thin crack below the bulging prow. Climb the crack and step around to the right of the prow to finish. Rap stations near the top of both finishes. Start at the Mindbender crack, veer leftwards to the first bolt, then up the green wall, at the 3rd bolt go rightwards then up the shallow corner. At the 5th bolt span out leftwards then go up to the over lap and on to the headwall. At the 7th bolt span right , then make a bit of height go left out to the arete then step around the arete, and home to the rap station. (a few small/medium wires lessen the runnout between the bolts on the lower section). For the traditional start, climb up the Birdbrain Gully, or (Option B, the cleaner and less traditional start climb the first 3 bolts of Cruxafiction, then step right.) At the first overlap, go around the left and then move onto the left corner of the gully. climb the corner until the small roof near the top of the crag. Exit leftwards and onto the sloping ledge, above Cruxafiction, using Cruxafiction's rap station. Good Pro. Climb the easy gully which is plastered with birdshit, crossing the mid-height diamond shaped roof on the left. Continue up, climbing flakes and edges in the centre of the gully with spaced protection to gain the slab under the capping roof, which is climbed in the centre. Up the gully as for Birdbrain, but above the diamond roof move right to the corner and climb to the roof. Layback around the roof to a steep and committing exit. With the increase in pigeon pooh during recent years, this route cannot be recommended. Start on the left side of the slabby wall. After the first bolt move up left into a blocky corner (wire placement). Continue up and slightly right to an overlap with a bolt on the slab above. (Hard move to stand on the slab). Using the arête above continue up, traverse left under the roof and pull through at its left side, standing up and moving slightly left to a huge perch. (Bolt in groove to right). Move round into the groove and climb more easily up, then slightly right and continue up the groove to the top. Eight bolts and optional wires. There is also a direct start and alternative finish by Richard at 24. A classic seventies crack climb - the obvious corner with a roof five metres up. Awkward jamming through the roof and up the crack to easier climbing above. Exit right on the ramp to abseil anchors in a large boulder directly above. There is also a direct finish through a small roof and up a shallow crack (19). Start immediately right of the Shortcut to Mushrooms crack. Go up through the overlap and climb the pillar pulling on the flakes, after the 4th bolt graduate onto trad gear. Crossover the Shortcut to Mushrooms crack around the large chockstone. Move leftwards onto the exposed prow above the roofs, past 3bolts, Stay rightwards clip the last bolt of Not Crack but Ecstasy with a long sling and complete the last 3 metres up the jam crack. Start on the face two metres right and climb past the bolt, through the small overlap at 6m small wires in the groove just beyond the overlap, or by an easier option on the edge to the right. Up the groove to a protruding block, step left to slabby rock and a short knobbly corner to gain the ledge. Finish up a hanging groove (small cam under a flake to the right), and top out as for Short Cut To Mushrooms. (Take a few brassies). Excellent climbing with tricky protection up the wall at a weakness three metres right of Short Cut To Mushrooms. Then climb over blocks in the corner and out the right side of the bulge above. From the ledge continue up the right-leaning groove (sling runner) with improving protection and hard climbing all the way. This wandering and poorly protected route starts in a vague groove. At five metres traverse left into the corner with marginal wires and join Ratchet Direct. Up the corner with better protection, moving right past the bulge to the ledge. Then head off rightward from the ledge up easy ground. Start as for Ratchet straight up the wall to the right of an obvious fin to a large undercut hold (cams). Bridge up and rock over left; gain a slab (wires) before finishing up the Ratchet normal finish. Natural protection, scary. Climb into a small niche and left into a vague bottomless groove, then up the groove to where the wall steepens (protection out left). Move up the steep wall past the bolts and slightly right to a good hold and gain a slabby ledge (wire). (At this point "Heretic" comes up the blocky corner on the right). Move up again and go left to a ledge and a good standing position on the arête. Back rightwards again to climb the easy wall just right of the final groove of Ratchet. Natural protection, double ropes useful. Vague groove line, loose blocks at base. An easy start up a wall leads to a hard move past the bulge into a groove. Move left through another bulge and up the next groove. Start up the face just left of the WW corner. Make your way through the overlaping corner, (there is a wire between 3rd & 4th bolt). After the 5th bolt use the crack above to to make the upper wall past the 6th bolt and onto the rap station to the right of the upper grooves of Ratchet. The prominent corner with a roof at six metres (crux). Easier climbing up wide cracks follows, with the angle easing off after 15 metres. Move left to finish and anchor at boulders. Walk left (north) to the abseil anchors on a large boulder. Or go rightwards to the DBB above Bruno. A chocolate brown slab capped by a large roof. Climb the brown slab direct to a bolt. Move up and right to the end of the roof, bolt runner. Using small holds come back left to the centre of the roof below a hanging arête. Poor holds give way to sloping holds on the right side groove. Pull into the groove via a pinch grip, bolt runner. Step up and out right onto the arête, bolt runner and finish more easily over the final roof to a double bolt belay above. The thin crack to the right of Women's Weekly. Start under the roof (loose rock), then up the crack and step right to the ledge. Continue with well-spaced protection in the weakness straight up the wall. DBB at the top of the top of cliff. Start under the right hand end of the overlap just left of vertical thinkng. Use side pulls to navigate the overlap followed by easier ground to a ledge. climb the vertical face above the ledge to join the last seven metres of Bruno (trad). Use DBB at top of Bruno. Start about six metres right of Bruno, beside the next route. Step left above a small drop onto a steep rib and climb a small groove to a ledge, then move left to a rib with brown rock, and up to a slabby area. At a small spike move left to a groove (still following the brown rock) to gain the top. Good natural protection, though some placements on the lower wall are a bit subtle (mostly wires). Excellent rock. Climb the flared double groove just right, move right and then back left of the grey rib. Climb the slab and avoid the bulge on knobbly rock to the right; then finish up slabs above with well-spaced protection. The heavily vegetated gully with large flakes jutting out. Straight up over the loose blocks and vegetation, then move right after about twelve metres to avoid the jungle. A metre right, climb the short wall (hardest at the bottom) and pull up over the protruding edges with good protection. Then wander up easy slabs and a steeper corner at the top, or move right to the Prime Suspect anchor bolts and abseil. At the start of Stigma/ Tupps Indespensable, Step right at the first bolt. Move onto the face, and up past another 2 bolts. Go up through the wide groove and then onto easier ground. Near the top clip the final bolt and step up to the rap station. Starts behind the cabbage tree. Clip the first bolt and move left and up through the roofs to the hanging corner. Move out left onto the rib, then step right and continue more easily up the arête tending rightward to the anchor for Older Not Bolder. Unfortunately this route takes the worst rock on the crag, and some holds are crumbling. Start at the same point as Au Natural but using a deep pocket swing left onto the steep, undercut arête and move up past the first bolt to poor holds. The poor holds continue until a good jug just above the second bolt. Climb directly up the easier wall to the corner, good ledge and bolt runner. High up on the left of the bubbly wall above is a prominent chicken-head, gain this by rocking over and clip the next bolt. Continue more easily up to a ledge with a bolt, finishing up the easy angled grooves to the anchors. Smooth shallow groove with a curving crack. Excellent climbing. Start slightly right and climb past a bush, then bridge and layback up the groove, and continue over bulges. Sustained. Rap stationat the top of the climb. On the broad arête between Bitterfingers and Rat Race. Place gear in Bitterfingers and traverse out right above the bush at eight metres, and up through a small alcove. Then through a flaky stepped overhang (gear on the left), and up the top wall. Take all opportunities to place gear. This route takes the two grooves in the middle of the wall. Start up a steep wall (unprotected), and into a groove. Move L into the other groove and up. Two exits. This is the direct line of the right groove of Rat Race, and incorporates the middle section of RR. Start down low and to the right in the scrub and bridge the V-corner to the thin crack (pro), Continue up over the bulge to gain the straightforward and fun exit groove. Good protection. Wanders up the arete between "Rat Race" and "There's an Arete in my Soup". Go up past 2 bolts at the base of the arete then onto trad gear. sneak around the first overlap by going right and then back left onto the ledge at the 3rd bolt. From the ledge go straight up the face until confronted by a blank wall, and the 4th bolt. sneak around to the left wall and up to the top of the climb and double BB. The slab and arête between Rat Race and Rheumatoid Corner. Hard start just left of the tree to gain the slab; then up the arête (protection to left) and join a thin crack At the bulge midway move right and diagonally through to the grassy groove. Finish up the slab and crack about two metres right of the final arête. The first ascent may have taken different variations. Spaced natural protection. The major corner with two small trees. Lost a boulder during the earthquakes, so look out for residual loose flakes, etc. Climbs the face / blunt arête just left of Hit the Deck to a lower off. Start in the small corner on the left and pull up rightward to the first bolt, then easier to the second bolt and hard climbing to clip the third. Pull through the small roof and cruise up the slabby wall, heading rightward to the Roll Up anchors. Five bolts with hangers. Starts three metres right of the corner, with a shallow groove through a bulge. Strenuous moves on small holds in the middle. Shares a double anchor with the next two routes. Good climbing. A metre right. Hard bouldery start just left of the obvious groove to a precarious position on the wall above the initial roof. Move up to the large roof and continue gymnastically upwards in to a shallow scoop on the lip. Easier climbing up horizontal breaks, then climb a shallow crack before exiting rightwards to the anchors. Starts in the centre of the buttress where a shallow right facing corner leads up to the roof. Climb awkwardly up to the roof and strenuously over it into a shallow scoop. Horizontal breaks enable a standing position to be achieved, exit easily leftwards across the upper wall to the anchors. Start up the slabby wall and move left to the hanging right-facing corner and up to the roof. Using the arête on the left surmount the roof and continue easily up to the Weed Eater anchors. 2m right of MMT, Start up Rh facing corner, then move slightly left onto the vague pillar, finishing up the headwall, to the rap station. The overhanging jam crack on the far right of the cliff, just left of the chimney. Strenuous. Hard to find anchors, but you can use large cams to the left. Prominent overhanging chimney with double cracks. Very steep, but excellent bridging and good holds. Inclined to be wet. Limited anchor options, probably best to use a pillar about three metres right. Steep right-leaning crack two metres right. Step off a tree or start directly and swing around the bulge; finish up the crack and niche. Anchor to the pillar. Information from Lindsay Main, Alan Hill, and Tony Burnell. Please note access changes, above. Hi Grubbie, I note there was some comment about loose flakes etc, have climbed here about four times this year, the crag doesn't appear any worse than pre quake with the exception of the area around Rheumatoid Corner. Also I replaced the anchor at the top of Roll Up, and two chains to lower off Bitterfingers. The new route Swab the Deck, somehow didn't get into the right place in the text, maybe you can shift it. You can shift the order in "children". drag the cross symbol on LHS of text up down.